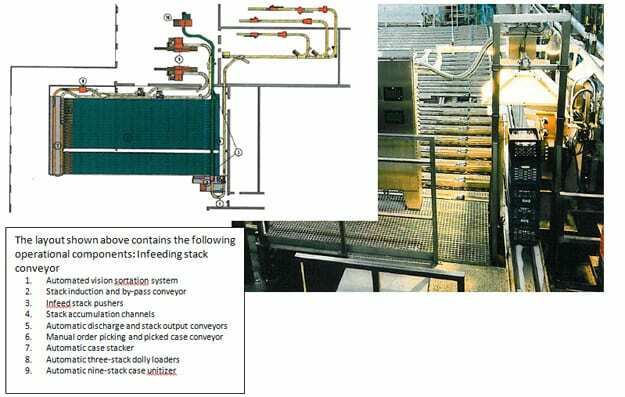 Automated Vision Sortation Storage and Handling is a technology developed by Cannon Equipment that modernized and streamlined the processing and packaging of dairy products. With our Vision Sortation system, stacks (prior to entering the accumulation lanes) pass under the computer controlled video camera which then reads each stack and differentiates them by cap color, container size, case pattern and stack height. In all, twenty-six or more products may be identified by the Vision Sortation System. Based on this identification process and the program entered for the day, stacks are assigned to a storage lane. Stacks are identified and conveyed to an assigned lane at a rate of 12 stacks per minute, with technology available for higher rates if required. Some accumulation lanes may be designated as high volume products and can be automatically discharged to fill orders, while other lanes can be used to manually “pick” orders as needed.